It's amazing – 10 years have already passed since RP Photonics has been founded! Now we celebrate not only that RP Photonics has survived, but that it has become a very successful company – in fact one of the most well-known companies in the area of photonics. In end of May 2004, RP Photonics Consulting GmbH was founded by Dr. Rüdiger Paschotta – at that time in Zürich, Switzerland. After a successful career as a researcher, he now offered technical consultancy in photonics: services like feasibility studies, independent assessments, problem solving and staff training. A challenging aspect of that start-up was that although Dr. Paschotta had a good reputation as a laser physicist among scientists, he was hardly known in the laser industry, his new target audience. In September 2004, the company's website was equipped with the first version of the Encyclopedia of Laser Physics and Technology. This was then rapidly expanded; in the end of 2006, it already contained 467 comprehensive articles, all authored by Dr. Paschotta. In 2008, the encyclopedia was published by Wiley-VCH as a two-volume book with 844 pages total. The online version grew a little further to over 600 articles by now, and has become an extremely popular and the perhaps most highly respected resource in photonics worldwide. Obtaining the order of 150,000 page views per month, it is the main driver of traffic on the RP Photonics website. From the very beginning, a particular strength of RP Photonics was its powerful simulation software. Initially, this was only used for consultancy, i.e., for calculating results for customers. Later, sales of software user licenses were expanded more and more rapidly. Nowadays, a wide range of both companies, universities and research institutes is using simulation and design software from RP Photonics – most often the product RP Fiber Power, which probably has become the market leader in this topical area. While initially it targeted only continuous-wave and pulsed fiber lasers and amplifiers, it is now also very useful e.g. for designing ultrafast lasers and amplifiers, various passive fiber-optic devices, and even many bulk lasers. This has become the economically strongest part of the business. 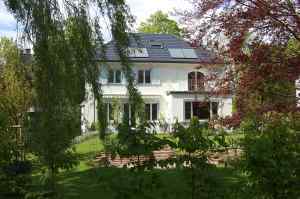 In December 2010, RP Photonics moved to Bad Dürrheim in southern Germany (about 100 km north of Zürich). This was done essentially because the founder and his wife found a beautiful property there, which also provided the required office space. As the majority of customers was anyway always outside Switzerland, the new location was just as suitable for the business as the old one. Particularly those customers who were discussing projects while sitting on the terrace would not deny that. In summer 2012, the new RP Photonics Buyer's Guide was established on the website. As it is intimately connected with the Encyclopedia of Laser Physics and Technology, it profited from the enormous user community of that resource and had substantial traffic from the beginning. Within just 10 years, RP Photonics has become one of the most well-known companies in photonics worldwide. So far, it has served over 100 consulting customers, mostly in the laser industry. The fastest growing (and by now most important) sector, however, is the simulation software business. As software license fees include substantial technical support, which can be used even for advice on scientific and technical issues, this can partly be regarded as a special extension of the consulting business. Note that competent support belongs to the most important aspects of software for sophisticated technical and scientific simulation and design work. The high reputation of Dr. Paschotta, who does both the development and the technical support personally, gives these software offers a very high credibility. 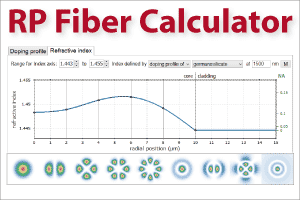 As another valuable gift to the worldwide photonics community, RP Photonics has recently decided to offer its newest software product RP Fiber Calculator for free – even for commercial use, and without requiring users to register. That software can be used for various important kinds of calculations in fiber optics. It also nicely complements the already well-known software RP Fiber Power in the field of passive fiber optics. Note also that the founder, Dr. Rüdiger Paschotta, continues a significant engagement with science. For example, he regularly attends scientific conferences, serves as a referee for various scientific journals, and occasionally still publishes scientific papers. The technical support for his software also often involves him in scientific work, as a significant portion of the software users are scientists. We don't see any reason why the healthy growth of sales of software user licenses should end. While the RP Photonics software is already well known, it is far from saturating the market. 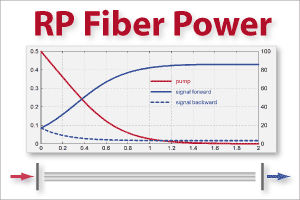 Particularly the product RP Fiber Power is more and more recognized as the most powerful solution in fiber optics. The recently launched free RP Fiber Calculator software will undoubtedly soon become very popular, and some of its users will presumably decide to move over to the planned PRO version of that software, which will offer additional very useful features. With the field of photonics achieving not only further growth, but some level of maturity, certain particularly valuable offers of RP Photonics in the consulting and software area are expected to become more and more important. For example, RP Photonics will extend its cooperation with fiber manufacturers in order to provide more data particularly on active fibers. This increases the value of optical fibers, as their behavior becomes more predictable, particularly due to the possibility to model their behavior with RP Photonics software. Another area with a promising future is staff training on specialized topics in the form of tailored courses, performed at the customer's place. Particularly bigger companies increasingly realize that the competence of their work force is essential for further success, and that there is hardly a more effective way of boosting it than such courses. Also, companies are expected to increasingly realize that competent feasibility studies and similar services are essential for keeping the success rate and efficiency of development projects high. The destination of the RP Photonics Buyer's Guide is clearly to become the dominant buyer's guide in the area of photonics within the coming years. After all, it is unique in providing an enormous wealth of high-quality technical and scientific information, and is also most convenient for the users. We will see to which extent these expectations will become a reality. Surely, however, you can count on RP Photonics staying an important player in the field, benefiting the community worldwide!